“Of course it isn’t,” most faculty would say to the statement above, but do they know how and why it’s not the same? What we’re learning through Story Circles Narrative Training is telling us volumes. Story Circles: Why so popular with research scientists but not graduate students? 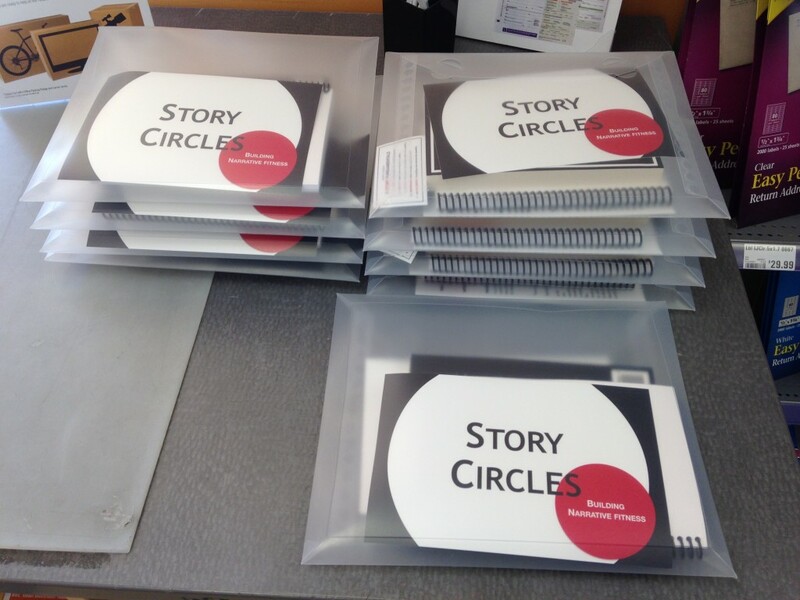 We’ve now had three years of development for our Story Circles Narrative Training program which has involved well over 1,000 scientists and communicators. We started with four prototype circles in 2015: undergrad, grad, postdoc, research scientists (conducted with USDA, NIH, Univ of Chicago and Hendrix University). The differences were evident from the very first meeting of each group. The participants in three of the prototype circles (undergrad, grad, postdoc) were curious and willing to do as asked, but overall, fairly hesitant. The members of the last group — 5 research scientists at USDA/ARS — within minutes after hearing about the ABT Framework began talking about all the different applications they could think for it. They jumped in with an enthusiasm reflected by Cathleen Hapeman of USDA/ARS who tells about that first Story Circle at USDA in the new video we will be releasing with AAAS. The rest is history as USDA is now approaching 15 Story Circles and a dozen Demo Days. Back then we thought that was just kind of interesting. Now we realize it’s fundamental to all communication training — the difference that previous experience makes. We’ve come to realize you need to be solidly motivated for the training to work. What this means is that the participants must have either a WANT (I’ve heard about this program and I want to do it) or a NEED (we know we need help with narrative). In fact, the one major modification we made after the prototypes was to split the training into two stages — first, the one day Demo Day where everyone learns what they will be signing up for, then the actual Story Circles training of 10 one hour sessions. The Demo Day is the weeding out that makes sure the participants in the Story Circles are sufficiently motivated since they are signing up on their own, not being required to do it (we’ve learned you can’t force this stuff on people). The result of this two stage process is that, of nearly 30 Story Circles to date, no one has quit before completing all ten sessions (with the one exception of a graduate student who felt he learned everything on the first day when he heard the three words of and, but, therefore — literally — and eventually quit). HOW IS A GRADUATE STUDENT DIFFERENT FROM A RESEARCH SCIENTIST? Has the science world thought deeply about this simple question? We can tell you one huge difference — experience. It turns out experience makes a huge difference in both focus and motivation when it comes to communication. Think about it in terms of the fundamental couplet of “arouse and fulfill,” that I cited in the first chapter of, “Don’t Be Such a Scientist.” (2nd edition coming out in March from Island Press!) What you get with graduate students is a shortage of arousal when it comes to communications training. In contrast, the research scientists — as we’ve seen from that first prototype group — have plenty of experience in the real world. They have taken part in, or at least watched, major projects fail to have much impact because their results were so poorly communicated. By the time we start working with them they are aware of what it means for a project to have “lacked a clear narrative.” That’s what experience brings. Yep. We’ve heard it from grad students. Many have said, “We got it — three words: and, but, therefore — all set.” At one university 50 grad students took part in the Demo Day. Of them, 26 signed up to do Story Circles, but a week later when the organizer tried to assemble the first circle, it turned out there were only 4 who really felt it was worth their time. The others said they mostly signed up just to lend their vote of support, but didn’t really see the need. The same happened two weeks later at another university with 38 grad students in the Demo Day. At another university there were 19 grad students signed up for the Demo Day. I gave my talk on the ABT the day before. When it came time for the 3-hour “hands on” part of the Demo Day, not one of the grad students showed up (though 3 faculty did). The organizer said she spoke with some of the students after my talk — they felt like they “got it” on the ABT thing and didn’t need anything further. This is all in contrast, for example, to the National Park Service staff in Colorado. They had 56 people in two Demo Days out of which came the 32 participants in the 6 Story Circles we ran this summer. It was completely optional for them. Almost all everyone wanted to do it — most of the others couldn’t work it in their schedules yet. I don’t blame grad students for not wanting to do Story Circles. Back when I was doing my PhD in biology I wouldn’t have had much interest in this stuff. The more I have honed in on the problem/solution dynamic that lies at the core of narrative, the more I’ve come to realize how often smart people provide solutions to people who don’t know they have a problem. Imagine being told, “We’ve got a solution for you!” but thinking, “I didn’t know I had a problem.” Guess what happens when people do this. Here’s an example from the real world of conservation biology. Three years ago the conservation groups in the state of North Dakota engaged in a huge and expensive exercise that proved to be exactly this. They created a state ballot initiative to “fix” the state’s conservation problems. It failed horrendously (20% supporting votes versus 80% opposing votes). I was brought in by a group to assess their communications work on it. So there you go. It’s hard to get people to work on a problem they don’t personally feel they have. That’s what we’ve run into with Story Circles with graduate students, repeatedly. Research scientists tend to know they need help with narrative based on their experiences, but graduate students just don’t feel the need for help … yet. We’re continuing to work on it and study it. It’s not that graduate students are lazy or have bad attitudes, it’s just that they are swamped — getting better at narrative is not a perceived priority. WHY ARE THESE OBSERVATIONS IN STORY CIRCLES IMPORTANT? Because what we are doing is systematic. This is not a different bunch of lectures and exercises with various one day workshops. To the contrary, Story Circles is almost cookie cutter in it’s rigidity and consistency. All groups that do the 10 one hour sessions go through the same structured one hour time course with each session. We’ve changed almost nothing about the training for three years now. The result is sort of like a controlled experiment. Everything is held constant between groups except the composition of the participants. If we had some sort of accurate metric (and we don’t — that’s a whole other discussion — narrative doesn’t lend itself to any simple, immediate measurements — if you think it does, you don’t understand it) we could probably quantify this difference between these two big groups. For now, we can simply see it in the different way Story Circles works (and doesn’t work) with them. Yes, this is of course an exaggeration. I’m getting a reputation as being an overly simplistic reductionist (thank you very much!). There are lots of grad students who do get it and work as hard in the sessions as research scientists. The students themselves are not the problem. The problem is simply TIME and EXPERIENCE. Telling students, “You’ll thank us for this some day!” and hope that will motivate them to do the hard work is not enough. Make no mistake, communication is challenging. You get back what you put in. There are no magic bullets, and even the almighty ABT Narrative Template is only as powerful as you what you get back from it by putting it to use repeatedly. This is the whole philosophy that underpins Story Circles. But the bottom line is that you gotta go to the gym and lift weights, even if its boring, repetitive and stinks like Brussels Sprouts sometimes.